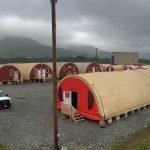 This camp began August 2013 and supported the flood disaster cleanup operations and rebuild of the village over the course of approximately 15 months for the SOA/DMVA/FEMA group. 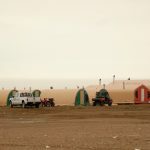 The camp was built to house up to 116 volunteers, federal and state employees, and Taiga Ventures staff and included fully catered 3 meals per day, all shower/laundry facilities, power generation, freshwater/graywater operations, and satellite internet/TV. Taiga employed up to 24 people specifically for this project to include kitchen staff, housekeeping services, and camp management on site.